Unlike other parts of Indonesia, it is not uncommon to see a café in Yogyakarta filled with only bules (foreigners, usually Caucasian) and their knapsacks. Yogyakarta, affectionately called Jogja, is known as the backpacker hotspot of Indonesia. Lonely Planet, the popular tourist guidebook, calls Jogja “Java’s premier tourist city, with countless hotels, restaurants and attractions.”[i] Unfortunately, too often, vacationers and even many locals, are not aware of the negative impact that tourism is having on the city. On Thursday, October 2, local artists cried out, or rather painted out, in protest with the theme “Jogja Asat,” meaning, “Jogja is drying up” in Javanese. That evening, local artists came together to spray paint a mural under the railway bridge Kleringan, commonly known as the Kewek bridge, which once thrived as the cultural center of the city. On March 1, 2013, the bridge was reclaimed from advertisers when young people joined together to rally against the commercialization of public space. Since then, the bridge has become a community art space where locals raise awareness of pertinent issues. 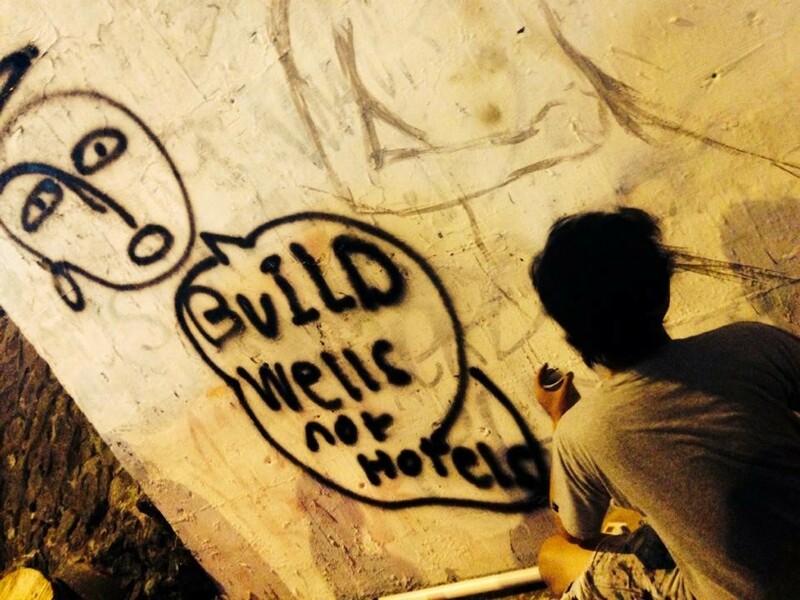 “The murals were created to show the anxiety of citizens who experience droughts as a result of the construction of hotels and malls that have been rampant in Yogyakarta,” said Zent Prozent, 23, a local street artist. 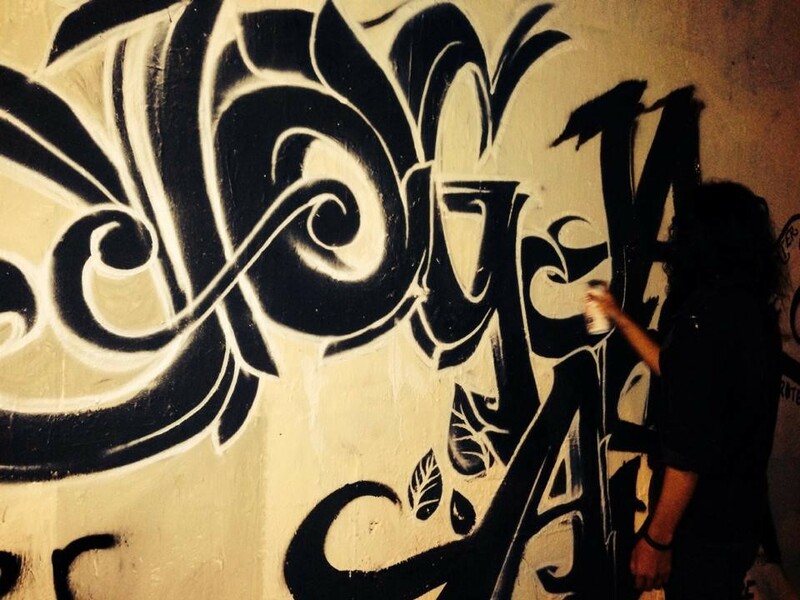 Zent spray-painted the words “Jogja Asat” on the mural, tagging the event with its theme. “The event had no name, no real leaders, and the focus came into being on the Tuesday night preceding the paint,” said Jonthon Coulson, 31, a Fulbright alumnus that was part of the event’s loose organization efforts. “Jogja Ora Didol” had been the theme of previous murals under the Kewek Bridge, which had been painted over by some unknown people. Similarly, this theme criticized the government for allowing hotel construction, which displaces numerous houses and cultural heritage sites. Just one day after the “Jogja Asat” mural was painted, sentences that criticized the government were covered up with grey paint. Though the paint may hide the words of the message, the images allow the community’s message to still ring clear: they have had enough. About the author: Annabelle Wilmott is a Fulbright English Teaching Assistant living in Yogyakarta, Jawa. She graduated from Saint Louis University Madrid Campus in 2014. She earned her degree in Political Science, Communication, and International Studies, with a minor in Spanish. November 2, 2014 in News, Politics, Uncategorized.